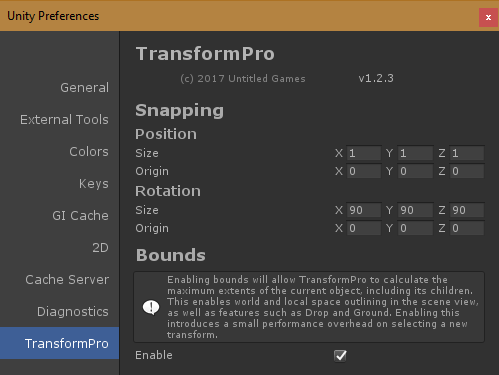 TransformPro adds support for both local and world space in the Transform inspector. The current mode can be viewed and switched at the top of window. Local Space is the default system used by the Unity Transform inspector. It means that the position, rotation and scale values shown are all relative to the parent object. Resetting a local space transform to default values causes it to become aligned with its parent. Objects without a parent are relative to the scene origin, so are effectively operating in world space. World Space means the position, rotation and scale are all absolute and relative to the scene origin. Any of the transform data can be copied from one object, and pasted to others. Simply click the appropriate button to copy the data, then shift-click or right click to paste the data back. 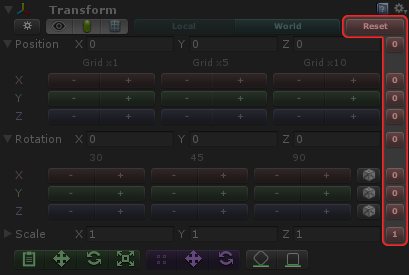 You can use the following buttons to chose which elements of the transform to copy or paste. The first button will copy the entire transform. You can mix and match using the other three, so you can for example copy position from one object and rotation from another and paste the combined transform to a different object. Note: The current Space Mode will be respected for both copy and paste operations, i.e. you can copy and paste in either local or world space. A simple but powerful tool, the reset buttons simply set aspects of the transform to the "blank" values. The main reset button at the top will set all 3 values at once. The individual buttons after the position, rotation and scale values reset the individual parts. The buttons inside the foldouts can be used to reset individual axis values. If World space mode is being used, this will manipulate the object in relation to the scene origin. The main Reset button in World space mode is handy for resetting objects for use in prefabs, for example. If Local space mode is being used, this will handle the objects in relation to their parent. Reset will align the object to the parent in all regards. Many of the individual tools are handy here, for example moving the object back to the parent position, resetting the rotation to match the parent orientation, or clearing a locally applied scale. TransformPro allows you to snap objects to a grid quickly and effectively. This is an essential tool for working with modular levels. As with all the tools, snap respects the current space settings. When using world space the grid origin will always match the scene origin. Local space can also be used to create a freely rotate-able block of objects. Local snap can be a little confusing. The orientation of the grid is dependant on the parent of the object, not the current object. 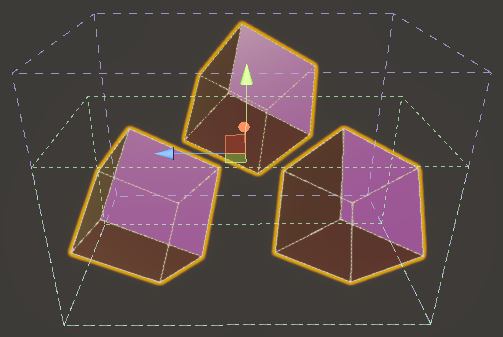 If you need to position a set of objects in a local grid they should always be grouped under a root object that represents the grid orientation. The grid can be customised in the Preferences. This includes not only the unit and angle sizes, but also offsets. By expanding the arrow next to the Position or Rotation labels, you can access Quick Snap shortcuts. 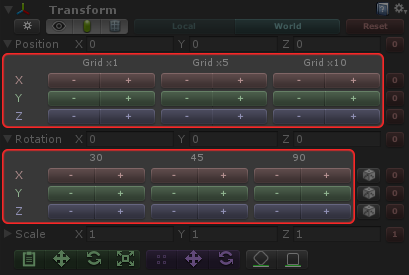 These allow you to apply common grid actions to the selected object, and are crucial for fast level building. The Position quick snaps allow you to move the object by 1, 5 or 10 grid tiles, and the rotation quick snaps by 30, 45 and 90 degrees. Other features such as Reset and Randomise can be accessed from here too. Currently the scale cannot be snapped, but this will be included in the upcoming sizing update. Shift-click or right click and of the quick snap buttons to clone and move the object. The new object will have the same name and parent object, perfect for lightning quick level creation. The Grounding system allows you to quickly drop objects precisely to the floor. This can save a huge amount of time when adding clutter to a scene. There are two different grounding operations - Drop and Ground. Drop simply moves the object down the floor without changing its current rotation. Ground drops the object to the floor, and realigns it. This is useful if you want to stand a box on a slight slope, for example. The floor must have a collider to be detected, but the object can be aligned without one. If the object has a collider it will be used, but if not the object will be aligned to the extents of its renderer bounds. For this to work Bounds must be enabled in the preferences. As the final position of the transform is determined by objects within the scene the Space Mode has no effect on these tools. TransformPro provides visualisation of the bounds of various components. Renderers: Shows the calculated maximum bounds of all types of Renderer for the currently inspected Transforms and all its children. These bounds are displayed in blue, and unrotated in world space. Colliders: Shows the calculated maximum bounds of all types of Collider for the currently inspected Transforms and all its children. These bounds are displayed in green, and unrotated in world space. Meshes: Shows multiple individual bounds around each MeshFilter contained in the currently inspected Transform and its children. These bounds are displayed in red and are displayed rotated, in local space. Each of these visualisations can be toggled on and off using this set of buttons. Note: This feature requires Bounds calculations to be enabled in the Preferences. Inside the advanced rotation controls, you can choose to randomise each of the axis values. This can be useful when placing down clutter, as you can ensure everything is properly randomised. Randomise uses a separate instanced Random Number Generator rather than the Unity default system. This means you can use the randomise feature, either through the front end or via the API, without affecting any other procedural generation systems you may be using. They allow you to change the grid position and rotation sizes, as well as any offsets you may require. There is a small overhead in calculating the bounds data, so you can disable it here if you want. 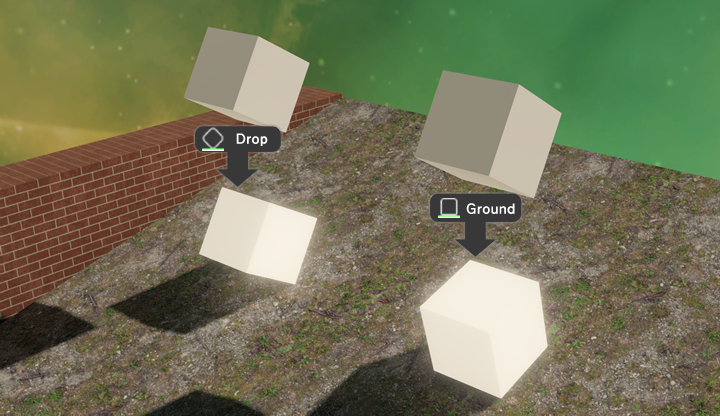 If disabled, bounds visualisation will be disabled, and the grounding system will require colliders on both the selected object and floor to function.